Overall, U.S. workers received a pay raise in the past year. But oil and gas workers received the biggest wages. Big pay hikes in the energy industry have helped fuel the biggest jump in U.S. wages in more than five years, according to an industry report released Wednesday. PayScale, which analyzes data from more than 10 million U.S. workers, reported that workers in the mining, oil and gas exploration industry have seen their pay increase by an average of 4.9% over the past 12 months and that has helped to push the average U.S. worker's paycheck 3% higher over the same period. That's the biggest increase since PayScale began monitoring compensation in early 2007. After languishing at or below 1% for 12 straight quarters beginning in the spring of 2009, wages have recorded strong gains the past six months. "The pay picture is brighter than it has been for a while," said Katie Bardaro, lead economist for PayScale. "The increases seem to be accelerating." After a brief slowdown in oil and gas exploration early in the recession, there has been a boom in the field. 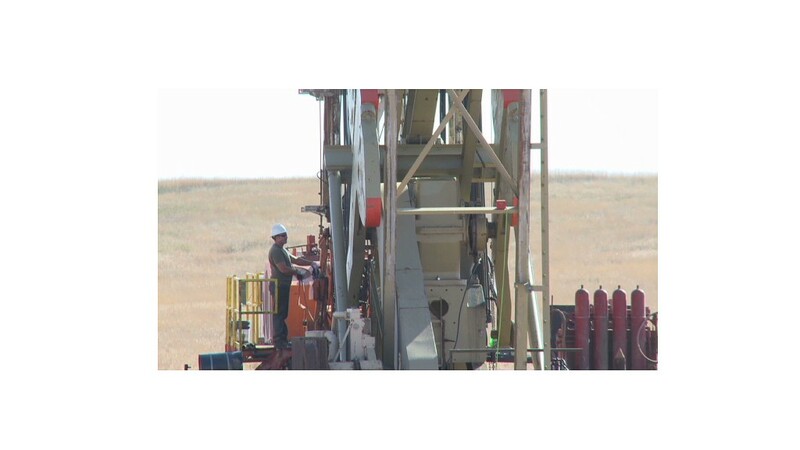 Drilling companies are flocking to places like North Dakota and the Northeast and prices at the pump have skyrocketed, nearly tripling since 2008. Related: Double your salary in the middle of nowhere, N.D.
Oil and gas workers aren't the only ones coming home with fatter paychecks. In fact, all of the job categories that PayScale tracks saw pay increases during the past 12 months. Information technology workers averaged a 4.5% increase in pay over the past 12 months. In places like Seattle, "there has been an almost crazy demand for IT workers," said Bardaro. 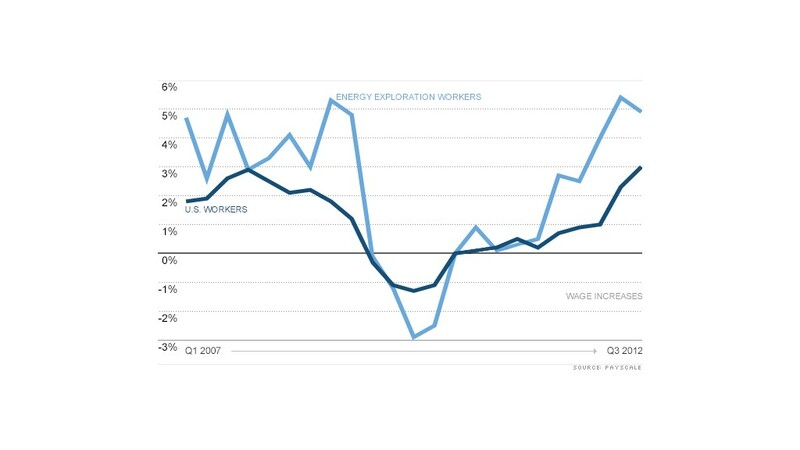 Pay raises in the utilities industry have also been strong, up 4.4% since September 2011. Social services workers saw the smallest increase over the past 12 months, with their earnings up a paltry 0.4%. According to Bardaro, social workers suffered a drop in demand for their services when the economy began to brighten and there were fewer out-of-work Americans. In the early years of the recession, demand for counseling for substance abuse, health problems and troubled marriages was much stronger. Pay raises varied a lot with location. Of the 20 largest U.S. metro areas, Houston recorded the biggest annual salary increase, 3.9%, followed by Dallas, San Francisco and Boston. All of these cities have heavy concentrations of either oil industry employers or high tech companies. Phoenix, St. Louis and Baltimore workers fared the worst, with gains of 1.6%. The pay hikes contrast sharply with pay trends at the depth of the recession. In 2009, the average U.S. worker's paycheck declined by 1.3% for the year. A major contributor to the improvement is an increase in corporate profits. However, many companies -- still gun shy about weaknesses in the economy -- are reluctant to hire workers. "Not everyone is hiring but they want to continue to increase productivity," said Bardaro. "It's cheaper to give someone a raise than to hire a new person."